Memory doesn’t exist. We are in the sea of the upper light and receive information from it according to our equivalence. That’s what is called memory. Everything exists in the upper light and depends on the degree of equivalence with it, up to being able to extract any states from it. Liberal politicians are nervous, sensing the familiar world is crushing: markets, banks, middle class will vanish. Consequently, the liberal media will lose their control over society. They’ll be replaced by new politicians and leaders—not speech-makers, but the business type. If I saw that by affecting others, I’m affecting myself myself, I would be nice to everyone by necessity, in fear to hurt myself. But Nature wants to bring us to the unconditional type of love, which is free of self-interest (“ahava lo tluya badavar“). We must always think that our connection with the Creator never stops although it is hidden from us. The Creator is found within our connection, and whether the Creator is revealed or concealed depends solely on our relationships. In the group we are connected by desires and thoughts and are affecting each other. Together, we also affect the Creator, who fills our desires and thoughts, moving nearer or farther away accordingly, as per the law of equivalence of form. Requests to the upper force differ in their aspiration toward correction. Although our connections are broken, as well as with the Creator, these connections exist, if only in a concealed form. A proper request motivates the upper to help the lower to reach the goal. Each year come Tisha B’Av, we mourn the ruin of the Temple due to our baseless hatred. And yet, each year we make our mutual hatred more entrenched. So what good are our tears? The horror-filled history of the 9th of Av does not end with the ruin of the Temple. Throughout history, this day of the year has been fraught with calamity. The 1290 expulsion of the Jews from England and the notorious 1492 expulsion of the Jews from Spain both happened on the 9th of Av. Closer to our time, on the 9th of Av, 1942, the Nazis began a mass deportation of 300,000 Jews from the Warsaw ghetto to the Treblinka extermination camp. Since the birth of our nation, the 9th of Av has been a bad day for the Jews. The Hebrew calendar reflects more than our history. On a deeper level, it reflects a process of transformation from self-centered beings—whose hearts are evil from their youth, as the Torah narrates (Genesis 8:21)—into a connected, mutually responsible nation, whose members are united “as one man with one heart.” On this cycle, the 9th of Av marks a crisis point, when we turn our backs on unity and condone self-centeredness. 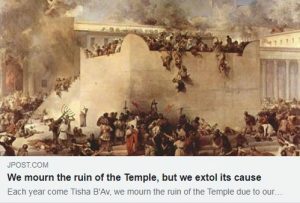 The ruin of the Second Temple is certainly the most traumatic event that happened on the 9th of Av. However, it is not the catastrophe itself that we should mourn, but rather our loss of love for one another, which induced it. On the cycle of our development, we begin as pure egoists. We want nothing but what is good for us, without any concern for others. “Sin crouches at the door,” the Torah tells us, and so we all behave. However, if our life’s purpose were to settle for being the species at the top of the food-chain, we would not seek immortality, superiority, renown, and other uniquely human ambitions. We would not need to invent everything we have created over the centuries; spears and arrows would suffice. Humans constantly aspire for perfection and eternity. We want to know what created the world, how it operates, and why. In a word, humanity wants to be like the Creator of the world—its owner. While this may not be true for you and me personally, without these basic drives we would not develop science, critical thinking, athletic competitions, or pursue all of the engagements that pertain to our human existence, beyond our physical survival. The human ego is different from that of animals. It is the driving force behind our development. And while nature balances the self-interest of animals, balancing human self-absorption requires our own conscious effort. Abraham, the man of mercy, was the first to find a method for containing human egoism. He and his descendants developed it until a nation based on mercy and unity was formed. But at the foot of Mt Sinai, the mountain of Sina‘a [hatred], we succumbed to our egos and instead of receiving the Torah, the power of connection, we turned toward the idol of the ego—the golden calf. Thus, the Tablets broke. Yet, our nation emerged from that crisis. We vowed to be “as one man with one heart,” thereby received the Torah, and were given the task to be “a light unto nations” by spreading the power of unity. In the battle between love and hate, the method that the ancient Hebrews developed was intended to lead the world to the ultimate victory of love over hate. This method very simply states that if we balance our egoism with love of others, we allow each person to realize his or her full potential, while using that realization for the common good. In this way, we “cover” our egos with love, or as King Solomon put it (Proverbs, 10:12): “Hate stirs strife, and love covers all crimes.” By doing so, we tap into the power of connection that created the world, and now sustains it. This is the inner meaning of receiving the Torah. Each year come Tisha B’Av [9th of Av], we mourn the ruin of the Temple due to our baseless hatred. And yet, each year we become more entrenched in our mutual hatred. So what good are our tears? What is the point of crying over our past ruin if at the same time we are preparing our own destruction due to the exact same reason that demolished us before? Have we really learned nothing from our past? How many more ruins due to mutual loathing do we need to experience before we finally wise up? The looming extermination of the Jewish people will dwarf anything we have ever experienced, including the ruin of the Second Temple, and including even the Holocaust, which, incidentally, extinguished the vast majority of my own family. We are on the last leg of the journey, the final frontier in the battle between love and hate. The hatred that is appearing now will be the most intense ever, and it will turn its wrath against the Jews. We cannot mitigate it whatsoever, but we can, and must, cover it with love, as we had done before. This is our vocation as Jews. It is the realization of our mission to be “a light unto nations.” As I have said numerous times before, on the internet and in the pages of The New York Times, we must cover our hatred with care for one another, and thereby set an example of unity for the world. We can do this willingly and pleasantly, or we will be forced into it by the fury of the world. One way or the other, we will do it. So this Tisha B’Av, let us think more about our future and our role, and less about our past. Let us focus on building the time to come, and make the ruin of the past the cornerstone of our safe and happy future. Only with a request can one get help from above—the force to resist the desire for self-pleasure, which allows one to rise above the ego and stay above it in faith above reason. So, the entire work is solely in the request! This is the only channel connecting us with the Creator. With our qualities, we can’t change the world for the better. But people will come to realize that we must live above the evil nature. This must be the 1st amendment to the Constitution. We must start scrubbing our hearts. Such a constitution will bring us to good. We need a genuine social network with the main message being—to unite over our differences. People will never resolve their conflicts, but we can find common interests on a higher level, in our collective ascent above ourselves.